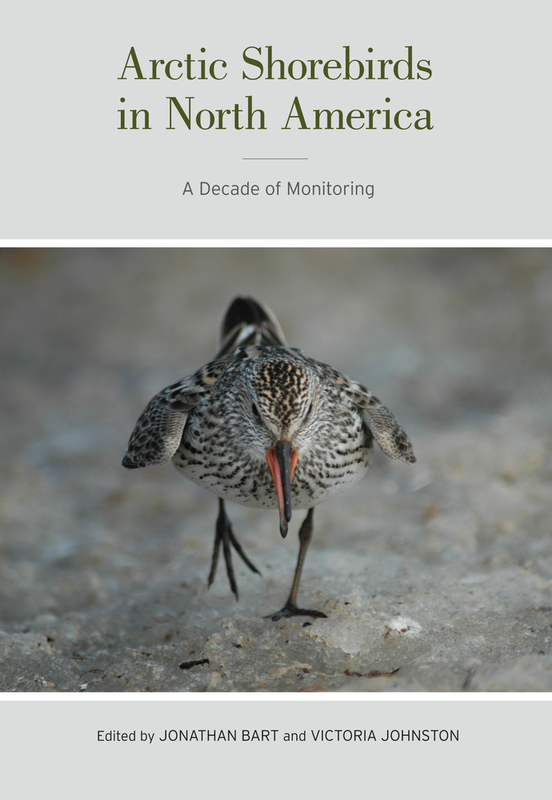 We report results from shorebird surveys in the North American Arctic, defined here as Bird Conservation Regions 2 and 3 of the North American Bird Conservation Initiative (http://www.nabci.net/International/English/bcrmap.html). The surveys estimate population size and trend, and provide information on habitat relationships, at the regional and Arctic-wide scale (Table 1.1, Fig. 1.1). 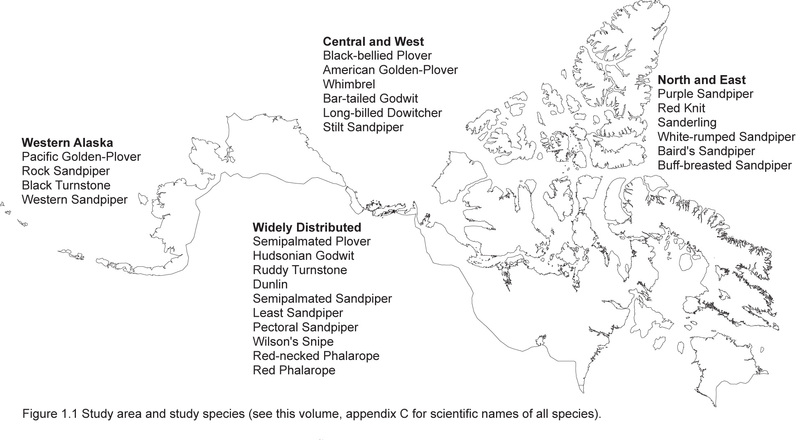 Of the 53 species of shorebirds that breed in the United States and Canada, 26 (47%) breed in the arctic in sufficient numbers that arctic surveys are an important part of monitoring programs for them (Brown et al. 2001, Donaldson et al. 2000; Table 1.1). Arctic-breeding shorebirds are a diverse group that exhibits a wide range of migration, reproductive, and wintering strategies (Table 1.1). 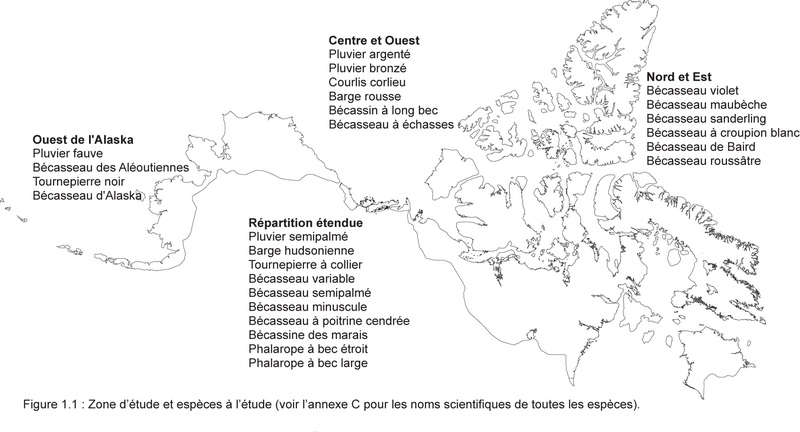 Some species migrate a short distance to the northern United States and southern Canada (e.g. Purple Sandpiper; for scientific names, see Appendix C), while others undertake epic migrations to West Africa (e.g. Red Phalarope) or southern South America (e.g. Hudsonian Godwit, Red Knot). Some migrate in huge flocks, while others trickle south singly or in small groups. There are monogamous, polygamous, and polyandrous breeders, and most habitats in the Arctic provide nesting opportunities for shorebird species. Despite their different life history characteristics, all Arctic shorebird species share two traits: 1) they are all are migrants (none inhabit the Arctic year-round) and 2) because of their migratory behavior, all are exposed to anthropogenic hazards at some point(s) in their life cycle. For more than a decade, concern has been expressed that shorebird populations around the world may be in serious decline. For example, a major review concluded that 48% of 200 populations with known trends were in decline, whereas only 16% were increasing (International Wader Study Group 2003). Since this review, further evidence has accumulated indicating broad declines among shorebird populations. Nebel et al. (2008) reported declines during the past 24 years of 81% for shorebirds breeding in Australia and 75% for shorebirds present there during migration. Many studies have shown that migration counts of shorebirds in eastern and central North America have declined, especially along the eastern seaboard (Bart et al. 2007, Morrison et all 2001b, Morrison and Hicklin 2001, Morrison et al. 1994, Howe et al. 1989). Niles et al. (2009, 2008) reported that rufa Red Knot populations have declined more than 75% and that populations of other species using the Delaware Bay may have declined. 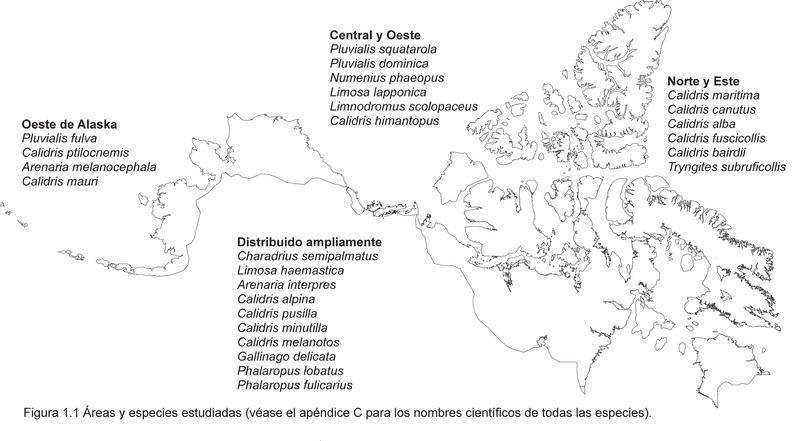 Numerous studies at Arctic breeding locations have also recorded declines in some species (Johnston and Pepper 2009, Smith 2009, Jehl 2007, McCaffery et al. 2006, Jehl and Lin 2001, Gratto-Trevor et al. 1998, Gratto-Trevor 1993). 5. Assist local managers in meeting their shorebird conservation goals. PRISM members proposed an Arctic-wide program whose objectives were to produce estimates of population size and trend, along with information on habitat relationships, at regional and Arctic-wide scales (Table 1.1). Obtaining population estimates, rather than just indices, was the most difficult, yet important, aspect of the Arctic PRISM sampling design. Most index surveys have numerous sources of potential bias so it is difficult to know whether change in survey results indicates change in population size or might be due to change in detection ratios (Williams et al. 2005). Knowing population size may also help managers judge how quickly a declining trend will put a species in conservation danger. When fully implemented, the Arctic PRISM program will have three "tiers": Tier 1 includes the Arctic-wide surveys to estimate population size and trends for each of the 26 focal species. The accuracy target for trend estimation adopted by the shorebird initiative, 80% power to detect a decline of 50% occurring in 20 years, will be adopted for Tier 1 surveys (accuracy targets for the estimates of population size have not been adopted by the shorebird initiative) (Skagen et al. 2003). Tier 2 includes long-term studies of demographic rates and other aspects of natural history at permanent sites widely spaced across the Arctic in Alaska and Canada. Tier 3 is a checklist program that includes annual collection of information of the distribution and abundance of shorebirds at sites visited throughout the Arctic. Taken together, these programs will provide (1) continuous, suggestive - though not conclusive - indications of population change (tier 3 checklists supplemented by counts outside the Arctic during migration and wintering periods), (2) highly accurate - though expensive - estimates of trend, to be undertaken every 20 years or more often if other, less conclusive, evidence suggests serious declines (Tier 1 surveys), and (3) investigations of causes of declines and how they might be reversed (Tier 2 surveys). In this monograph we present results from the first 10 years of Arctic PRISM surveys. The monograph is organized in four parts. The Introduction includes this chapter and a detailed discussion of the methods including the sampling plan, field methods, and analysis (Bart et al., this volume, chapter 2). Methods are not described in later chapters unless they differed from the methods described in Bart et al., this volume, chapter 2. The second part, Regional Reports, includes six chapters reporting results from all of the regions surveyed to date. The areas surveyed include four sites in western Alaska (McCaffery et al., this volume, chapter 3); the North Slope of Alaska (Bart et al., this volume, chapter 4), Yukon North Slope and Mackenzie Delta (Rausch and Johnston, this volume, chapter 5), Southampton and Coats Islands (Smith et al., this volume, chapter 6), Prince Charles and Air force Islands west of Baffin Island (Johnston and Smith, this volume, chapter 7), and briefer surveys in several widely-distributed areas (Bart et al., this volume, chapter 8). The surveys in all of these areas used the same general approach, and all provided estimates of population size (number of shorebirds present in the surveyed area prior to hatch) that had little if any bias, and that were accompanied by standard errors (SEs) and coefficients of variation (CVs). The third part, Methodology, includes five chapters that cover topics not discussed in Bart et al., this volume, chapter 2. During the past few years, we have realized that aerial surveys, flown in helicopters at low elevation and slow speeds, can be used to obtain extensive information on shorebird distribution and abundance. While the results cannot be used to estimate population size, they are of great value in developing and refining the sampling plans used to select plots. This method is discussed in Elliott and Smith, this volume, chapter 9. We have always known that a few species - especially ones that are uncommon and have large home ranges - can be difficult to survey using our ground-based methods. Pirie and Johnston, this volume, chapter 10 addresses this issue for one such species, the Whimbrel, by comparing results from aerial and ground surveys. Pirie et al., this volume, chapter 11 and Armer et al., this volume, chapter 12 discuss the current status of Tiers 2 and 3 and suggest how these components of the overall Arctic PRISM approach may best be enhanced. Bart and Smith, this volume, chapter 13 discusses allocation of effort to different parts of the sampling plan and presents results from a simulation to estimate how much effort will be required to achieve the Arctic PRISM accuracy target. Part Four, Synthesis, includes three chapters beginning with a detailed summary of the results presented in regional chapters, Bart and Smith, this volume, chapter 14. This chapter will be an appropriate starting point for readers wishing the "big picture". Bart et al, this volume, chapter 15 discusses priorities for the future including both methodology and regions to survey. The final section of the monograph contains more detailed information including (Appendix A) an explanation of why the framers of Arctic PRISM did not believe that migration or wintering counts could achieve the PRISM accuracy target of 80% power to detect a 50% decline in 20 years. Extensive tables of estimates with measures of precision are provided in Appendix B. The entire data set has been posted on the Coordinated Bird Monitoring web site (http://cbmdms.dev4.fsr.com/Default.aspx) along with the comprehensive analytic program, DS (for double-sampling), prepared during the course of this study. Arctic PRISM is one of the most ambitious monitoring projects ever undertaken for non-game species. It has involved dozens of principal investigators, hundreds of cooperators, and thousands of hours of field and analysis time. Controversies, particularly over the methods, have occurred (Arctic PRISM Peer Review Committee 2010) as is inevitable in large, novel programs. However, despite the difficulties, data have been collected throughout the Arctic in North America, and, as this volume goes to press, Canada has decided to complete the first round of Arctic PRISM surveys and shorebird specialists in Alaska are discussing plans to continue the surveys in western Alaska, perhaps in 2012. We are therefore hopeful that the entire North American arctic will be surveyed using the PRISM methods, after which another round of evaluation should be carried out. Acknowledgments are included in each of the subsequent chapters. Here we wish to thank our agencies, the US Geological Survey and the Canadian Wildlife Service, for their support of this work during the past decade. Also, we pay tribute to early support from the US Fish and Wildlife Service, and especially to Kent Wohl and Brad Andres, for helping J. Bart and others develop the basic survey methods. 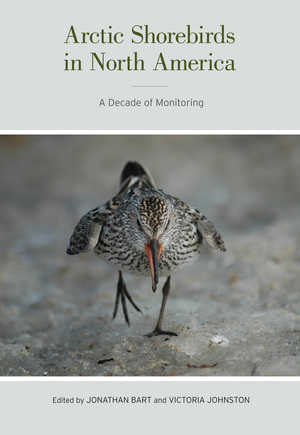 When that work began, no one knew that within a few years a major shorebird monitoring initiative would begin and that, ten years later, the shorebird community would be able to produce this volume. Each year shorebirds from North and South America migrate thousands of miles to spend the summer in the Arctic. There they feed in shoreline marshes and estuaries along some of the most productive and pristine coasts anywhere. With so much available food they are able to reproduce almost explosively; and as winter approaches, they retreat south along with their offspring, to return to the Arctic the following spring. This remarkable pattern of movement and activity has been the object of intensive study by an international team of ornithologists who have spent a decade counting, surveying, and observing these shorebirds. In this important synthetic work, they address multiple questions about these migratory bird populations. How many birds occupy Arctic ecosystems each summer? How long do visiting shorebirds linger before heading south? How fecund are these birds? Where exactly do they migrate and where exactly do they return? Are their populations growing or shrinking? The results of this study are crucial for better understanding how environmental policies will influence Arctic habitats as well as the far-ranging winter habitats used by migratory shorebirds. Jonathan R. Bart is a Research Wildlife Biologist with the Forest and Rangeland Ecosystem Science Center of the USGS in Boise, ID. Victoria Johnston is a former biologist, now Policy Analyst, for Environment Canada and is based in Yellowknife, Northwest Territories. 9. AERIAL SURVEYS: A WORTHWHILE ADD-ON TO PRISM SURVEYS, ESPECIALLY IN THE INTERIOR?